The Principality of Monaco is a tiny constitutional monarchy located on the famous French Riviera; its less than one square mile of territory, with the highest population of any independent country, is squeezed in between southern France and the Mediterranean. The excellent weather, lovely landscape and openness to gambling have made Monaco a favorite playground of Europe's wealthiest and most high-profile celebrities, and lax banking and tax laws (there is, for example, no income tax) have helped the financial sector here to thrive. Among principality's many attractions is the renowned Monaco Grand Prix, perhaps most prestigious auto-racing venue in the world, which has been held here every year since 1929, and during which the city streets become a race course. 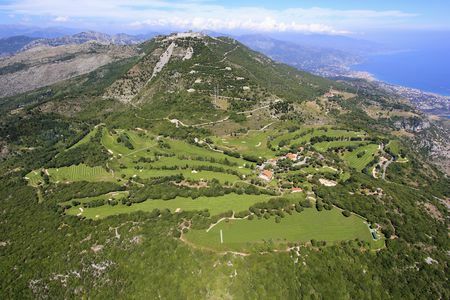 Another attraction is Monaco's one golf course, which is located up in the foothills of Mont Agel (in La Turbie, and officially in France rather than Monaco) at an elevation of around 3000 feet, so it offers spectacular vistas of the sea and shore below. The original design was by Willie Park, Jr. over a century ago, and it features lots of hills and a number of tough blind shots. The par 71, 6100-yard layout relatively narrow fairways demand accuracy, and the well-kempt greens are quick but true.